This is the new castle that is now ready to order. All components are manufactured using 6mm Medite MDF and machined using the latest CNC technology. The whole structure slots into the base board. The castle includes a drop down drawbridge. There is a long ladder for each of the four towers and 4 shorter ladders for the ramparts. 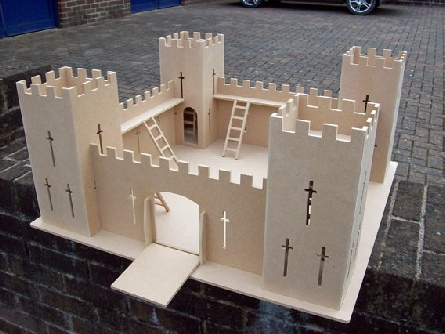 This unique castle will make an ideal present for any young boy. Easy to follow assembly instructions with colour images are included.